So UKNOF, we meet at last. On the 22nd of January I went to the 30th meeting of (mostly) UK based network operators. 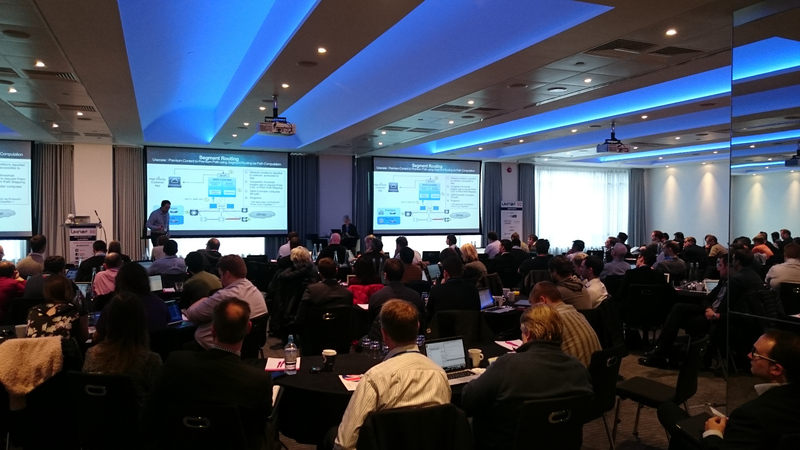 It was held in London in a very nice building (etc Venues Bishopgate) and it had 290 registered attendees, apparently being the biggest one yet. More stats you say? I'm not sure how many actually attended, but the big room was packed and (myself included) we were 115 first timers in total. To get a sense of scale, that's about half the room in the picture below. Content was king as there were 17 presentations, recorded and transmitted live online, with one exception: the Team Cymru segment. There was also a surprise appearance from a UK-Police-Cyber-Security-Anti-Crime-Agency-Unit-Special-Task-Force chap who asked for help and cooperation. The videos are up on Youtube already and the slides can be found on the UKNOF website. If you didn't manage to come in person or stream on the day, you probably won't have time to watch all of them - so here's a summary to help you decide. Next Gen Sky Broadband Core Network was nice, but I thought it a bit long - good history of how their core evolved from a bunch of CRS-1s to being the only NCS6000 deployment in the UK. Worth quickly going through the slides. BT North of Scotland Cable Build is a must-watch, both informative and entertaining. It's not every day that someone can say they lost an 8 tonne plough while laying fibre. Beyond RPKI: Golden Prefixes - Job Snijders suggests a new option for those that don't like IRR and RPKI, which has been already developed by NLNOG. Euro-IX and IX-F Update - Very good effort and lots done (BCOP, tools) and hopefully the effort for a unified database will be successful. If IX is your hot topic then Open-IX: Beyond Year One is a good update as well. RING SQA: blazing fast outage detection - I didn't get to listen to a good part of this due to some interesting coffee break discussions, but I will be watching the recording. Two DNS related presentations were unexpectedly awesome: Anycast on a shoe string a proof-of-concept anycast service on a budget and a live demo of BumbleBee which is Nominet's DNS traffic analysis system. In the OK category we have the Segment Routing introduction (not enough time to do SR justice), Kea Update (opensource DHCP server), OpenNMS (cool, but it's Java and apparently difficult to deploy) and Dissecting Significant Outages from 2014 (ThousandEyes). In the "ugh, how can you sell what's not technically yours" category we have UK IPv4 Transfer Market. Worth a watch just so you know what's going on and how much money's being made out of IP addresses. Finally, in the "I'm not sure what you're trying to do here" category we have: the DDOS presentation by Corero, DHCPv6 Operational Challenges (I really disliked the tone and bias of the Infoblox presenter) and the SDN/NFV Truths (watch a marketing guy show funny pictures to a room full of engineers). It was great. As you can see above, plenty of diverse and interesting topics without much fluff, as it should be at a meeting like this. Organization was spot-on, everything went smoothly - so a massive thank you to all who made it happen! I'll be coming to future meetings for sure (and hopefully contribute in some way), so keep up the good work!